The large painting I made for the Dalai Lama in 2014 is currently exhibited in Spiritual center De Roos in Amsterdam. Traditionally, a painting with the Eight Auspicious Tibetan Symbols is put in the floor or directly created on the pavement, but in this exhibit we chose to beautifully hang it near the shop of De Roos (where my artwork is sold as well). At the same center in Amsterdam I will offer a three day thangka course on how to draw the auspicious symbols, on Dec. 9, 10 and 11, 2016. In the same month I offered the very first thangka painting class in my birthplace Zwolle in the eastern part of Holland. This day workshop is part of the four Happinez Workshops that I organized after the article and interview about my artwork and passions in Happinez Magazine. 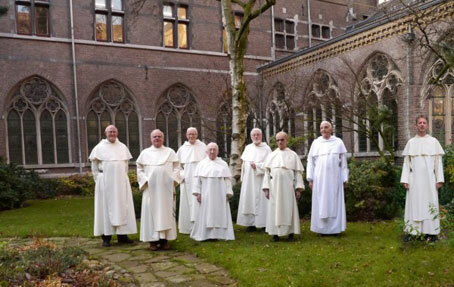 The monastery is still in use: there eight Dominican brothers live here today. The Dominican community is very open to developments in church and society, and everybody is welcome. You can pay a short visit to the church, the Garden of Silence and check out the old stained glass and fresco paintings, but you are also welcome to stay for a few days and to meditate, reflect and learn about the life of the Dominicans. In this meditative environment I offered a meditative drawing class where people learned how to create the Buddha.